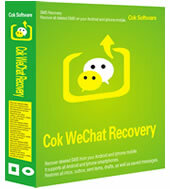 Cok SMS Recovery can retrieve deleted message in all iPhone and Android phone. It supports all iPhone such as iPhone X, iPhone8, iPhone7, iPhone6, etc. It also supports all android phones such as Samsung, LG, Motorola, HTC, Huawei, Xiaomi, etc. After deletion of message from your phone, the data blocks storing the message are not deleted from the database file immediately, but are marked as the unused block. These data blocks can be covered only when new message are stored in the database. If you use Cok SMS Recovery for recovery before the deleted data blocks are covered by the new message, you can successfully recover all the SMS. Otherwise, the chances of successful recovery is between 5% to 100%. This tool model mouse click action including left-click and right-click continuously. It let computer users break away from onerous and repeated work! You only need to move the mouse to the place where you want to click and then press the hotkey. Cok Free Auto Clicker will click automatically in accordance with your instructions. When you need to stop auto click, you only need to press the hotkey again. What's even better is you can set this tool "Run on Windows Startup" and "Minimize Start-Up". After you checked these two options, the software will auto run when computer startup and minimize to tray icon, so you won't notice its presence until you click the hotkey. It support all the 32 bits and 64 bits Windows XP, Vista, and Windows7 system. If you have problem when you use it in Vista or Win7 system. Please find the solution in FAQ page. It is green software which you needn't to install it. After you download it, you can run it directly. Cok Free Auto Clicker is suitable for gamers and other people who special needs the function of mouse clicking automatically and continuously. Another surprise, you can use it for free no time limit. Cok Free Auto Typer is the best solution for Customer Service in internet to answer repeated question and other person who need special requirements to submit repeated tables, forms. This auto input software saves time to type words in keyboard and improved efficiency a lot. It input any text including article, passage, phrase by press the hotkey of the settings. If you have set many sentence so you are confusable what shortcut key you should click, you can active this software and double-click any item to copy it to the clipboard, then you can paste it to any input box. In order to save times and simplify operations more, you can press hotkey ( default is Ctrl+T ) to active the window and press the hotkey again to hide it. Also you can let this free auto typer software in the screen coner and set it always on top to prevent other window cover it, then you can press the hotkey refer to your settings in the software interface. This software is mouse emulating software, it simulates mouse operation by operating your keyboard. You can use numeric keypad area to control your mouse moving and clicking easily. Clicking 0, 1, 2 represent mouse left click, mouse middle click and mouse right click. Clicking 4,5,6,8 represent mouse moving to left, down, right and up. It won’t disturb you to use other key in your keyboard. You can use other key to input characters normally. Further more, if you need to using numeric keypad to input number, you can press start/stop hotkey to switch, the default shortcut key is F9. Another useful function is you can set it run automatically when the windows startup and minimize to tray icon when this software begin to run. 1, Only record input voice from microphone. 2. Only record output voice from your computer (sound card). 3. Record both input voice from your microphone and output voice from your computer. Cok Auto Recorder is used for recording audio calls from chat software on PC. When you(or other person) make a audio/video call on this computer, it will record the sound from both sides automatically. And it will stop recording when you or other party hang up the call. Even if you wear earphones, the sound from both sides will be recorded and A high quality mp3 file will be created on your computer. You can find it by clicking "View Logs" on this software easily. We can use iTunes software to back up all files from iPhone or iPad to computer, but we can't view all files on computer directly. With Cok Free iTunes Backup Extractor, we can extract backup package file and export any folder or file to computer for more operation. Such as we can export messages database file(sms.db) to computer and then use Cok SMS Recovery to recover deleted messages. Also we can use it to export the folder of Wechat messages and WhatsApp messages. All in all, we can export any files which are generated with any apps on your iPhone or iPad.